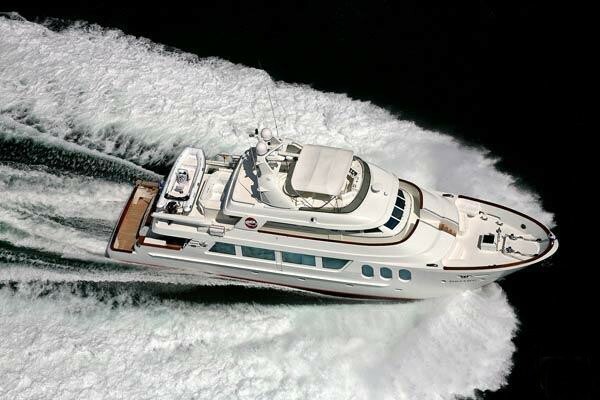 Motor yacht BERADA is a 29,87m (98') yacht built by MCP yachts in 2007. 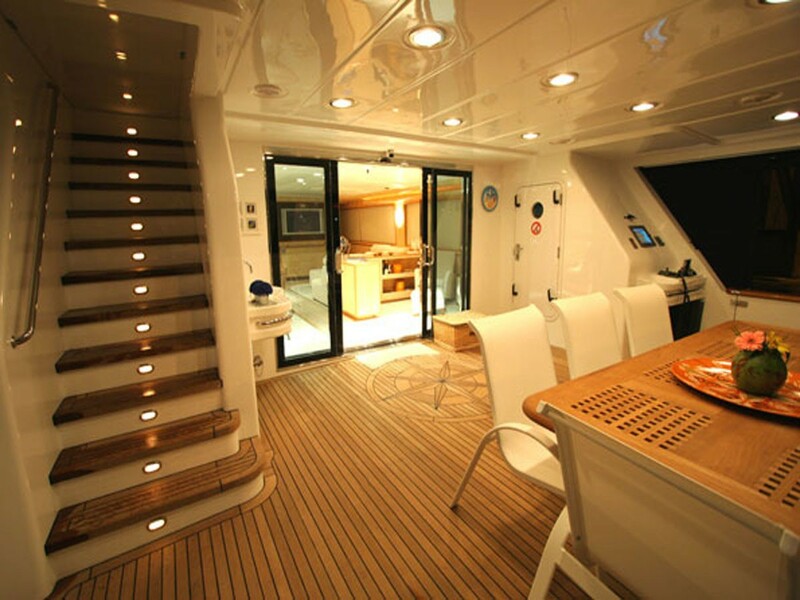 Yacht BERADA (ex EAGLE’S NEST) has a main deck which features a full beam design in order to maximize main salon volume, which has unusually high headroom of 8’2”. 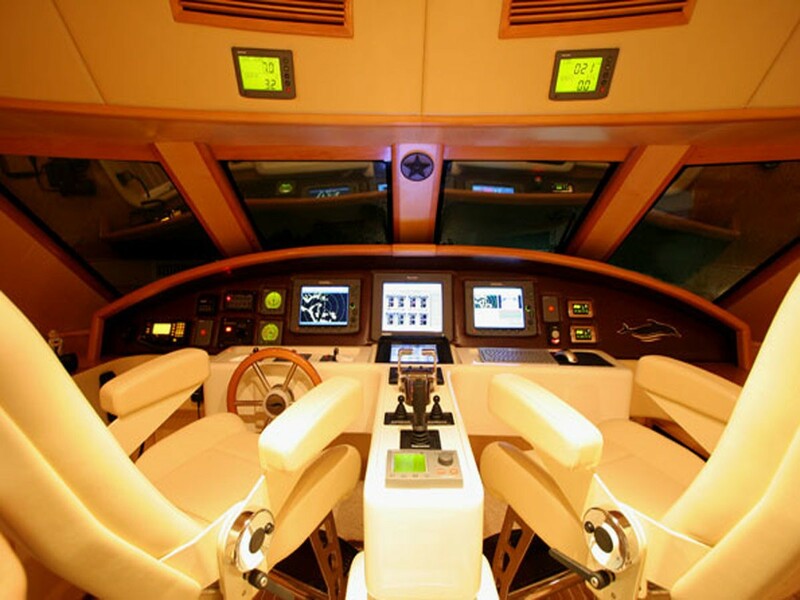 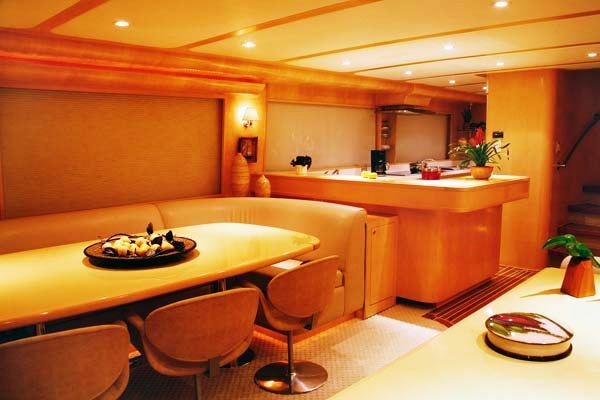 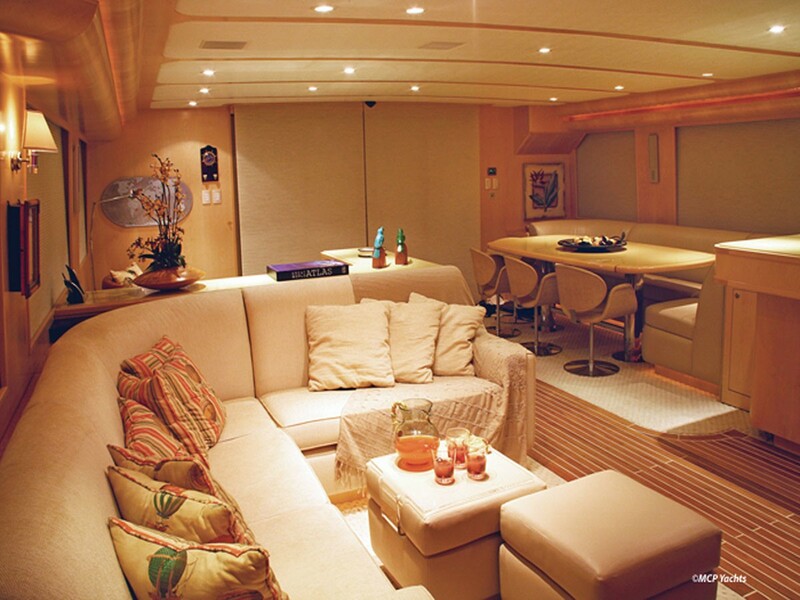 The yachts main salon has sofa and home theatre area with 42” TV, DVD, Direct TV individual satellite receiver, a Crestron System and iPod docking stations. 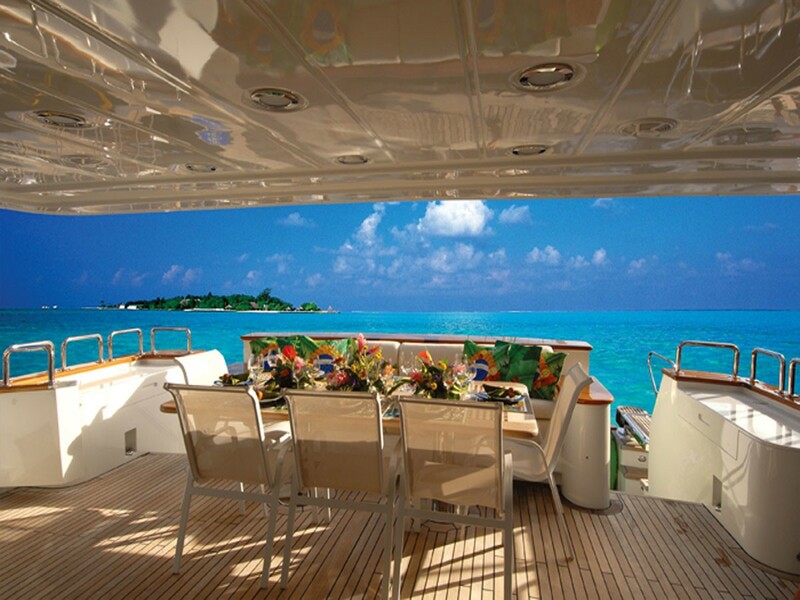 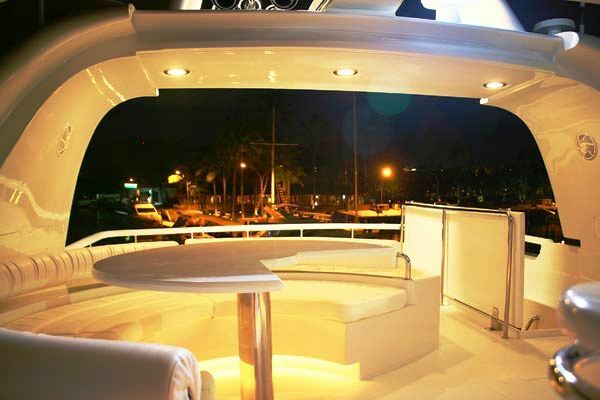 The Dining area is located on the port side and offers seating for up to 10 guests. 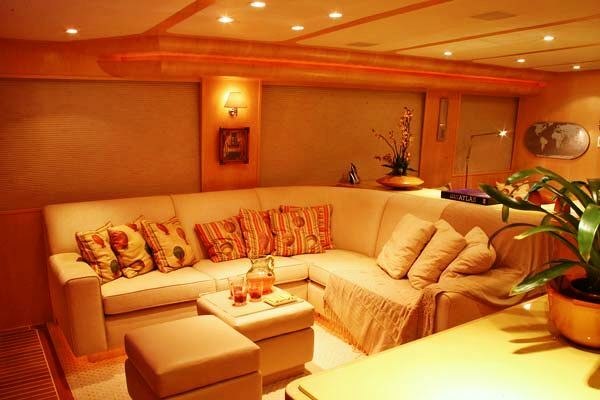 There is a reading area with two single couches to starboard. 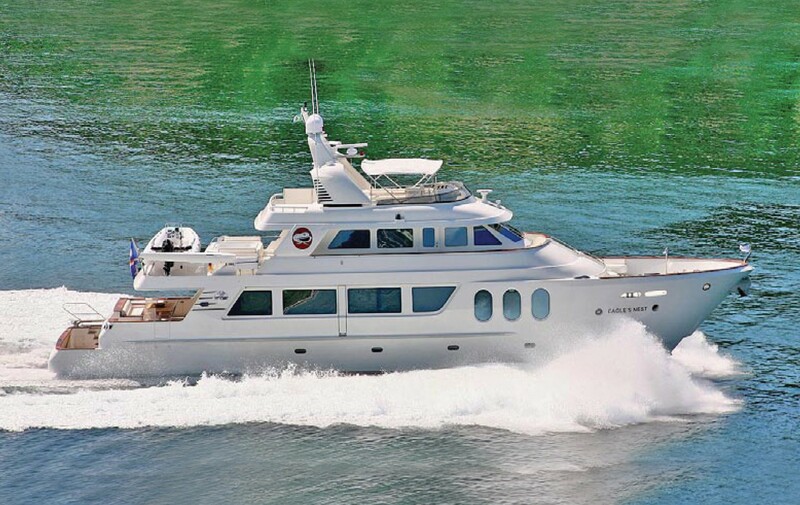 Motor yacht BERADA has accommodation for up to 10 guests in 4 cabins including a master stateroom 2 mid-ship queen cabins to Port and starboard and a twin cabin to port with 2 upper and lower built-in bunks accommodating up to 4 children. 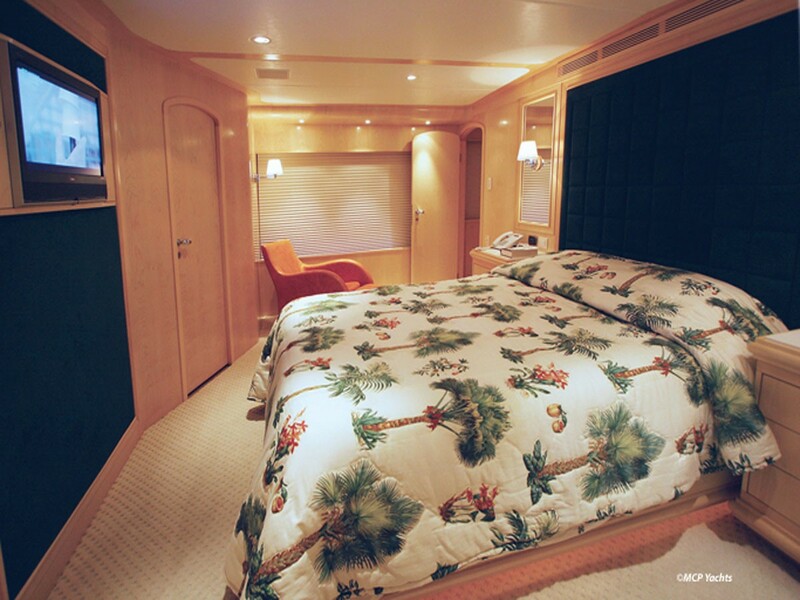 All staterooms have a Crestron audio system with surround sound, blackout blinds and port holes allowing natural light to filter the lower deck. 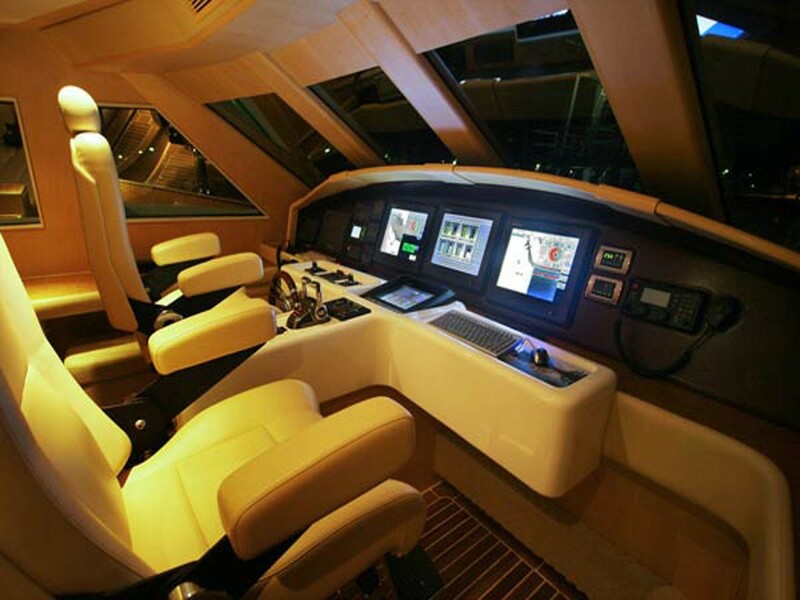 On the Bridge deck, there is a sky lounge which has a 37” TV, Direct TV individual satellite receiver, as well as a card table for up to 6. 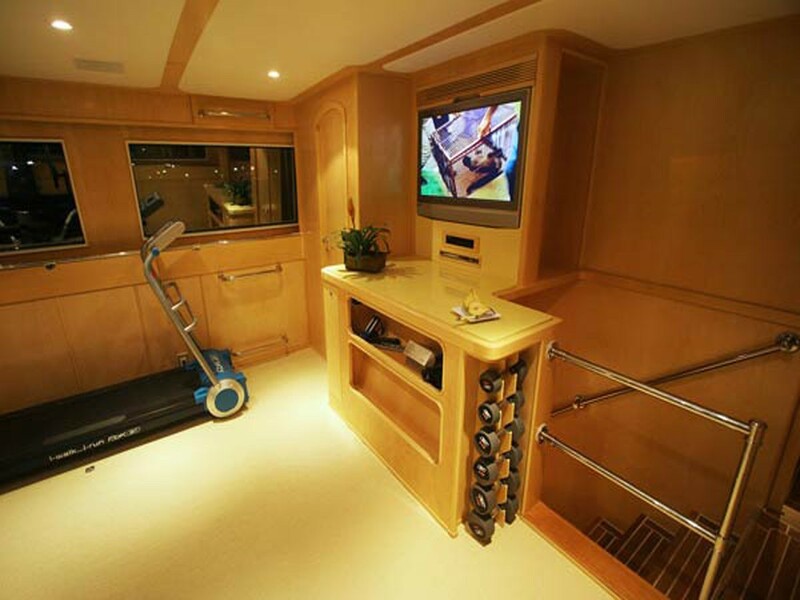 This area also features a treadmill, weights (ranging from 3 – 7 KG), and a day head. 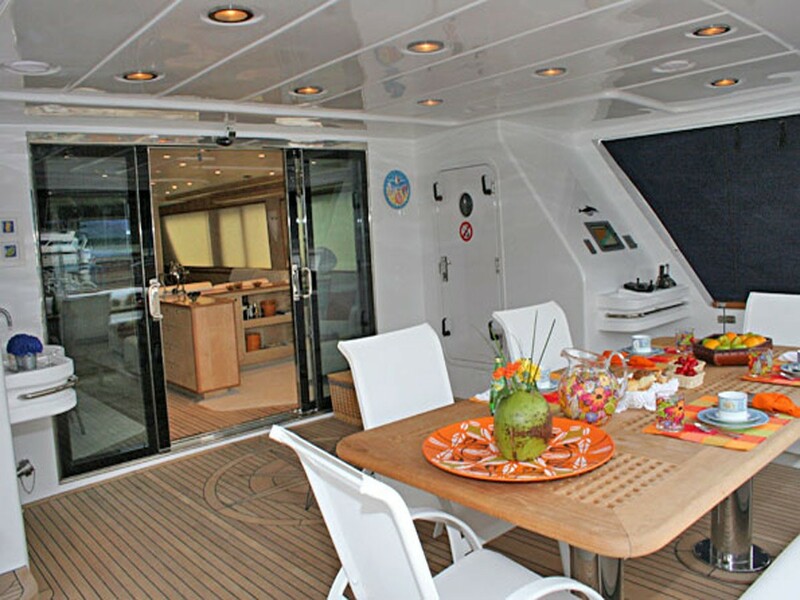 On the Bridge Deck aft there is a semi-shaded area with a large Spa Pool and sun pads, along with BBQ, ice-maker and access to the aft deck and sun deck. 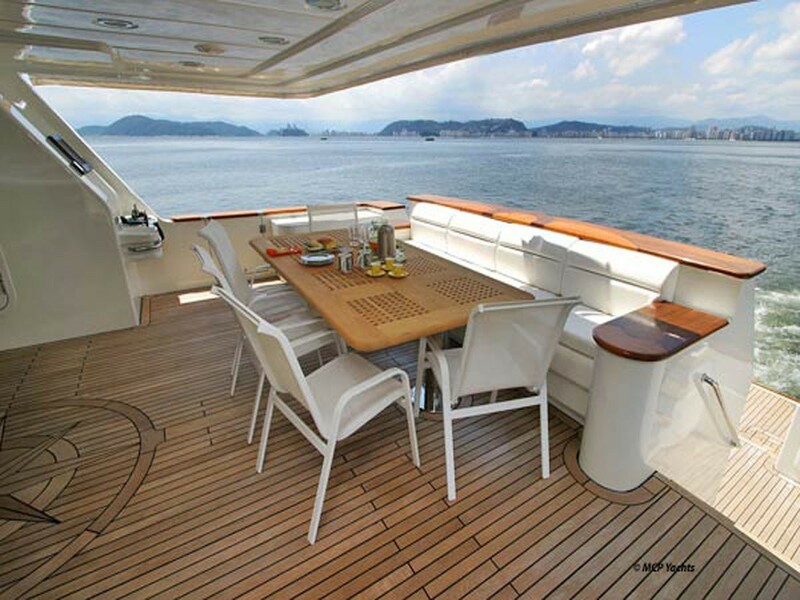 There is also access the bow area which has a Solarium with comfortable cushion seats on both sides, via the walk-around Portuguese deck. 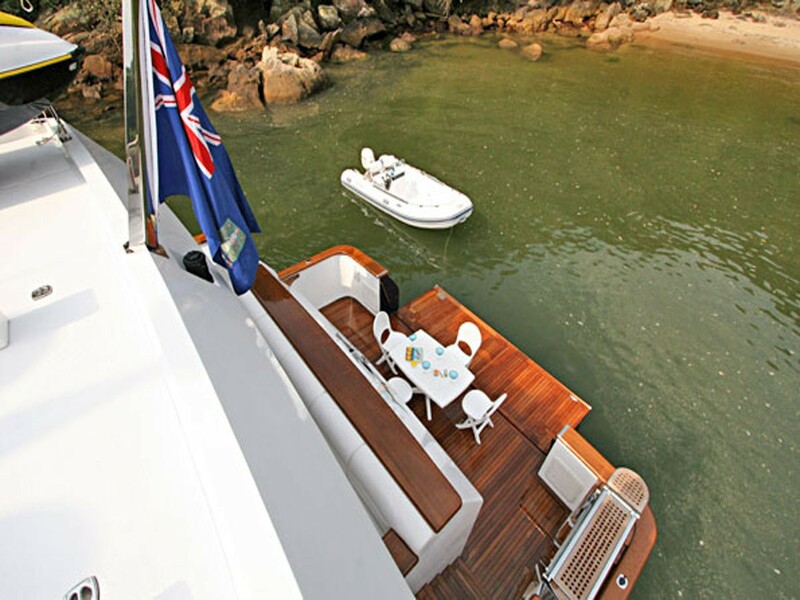 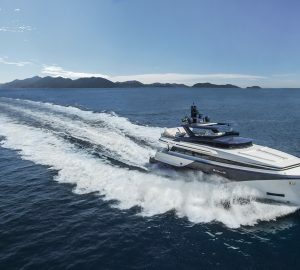 The expansive semi-shaded aft deck offers al fresco dining with seating for 8-10 guests, as well as access to the cockpit and large swim platform which is a folding down bulwark hydraulic platform. 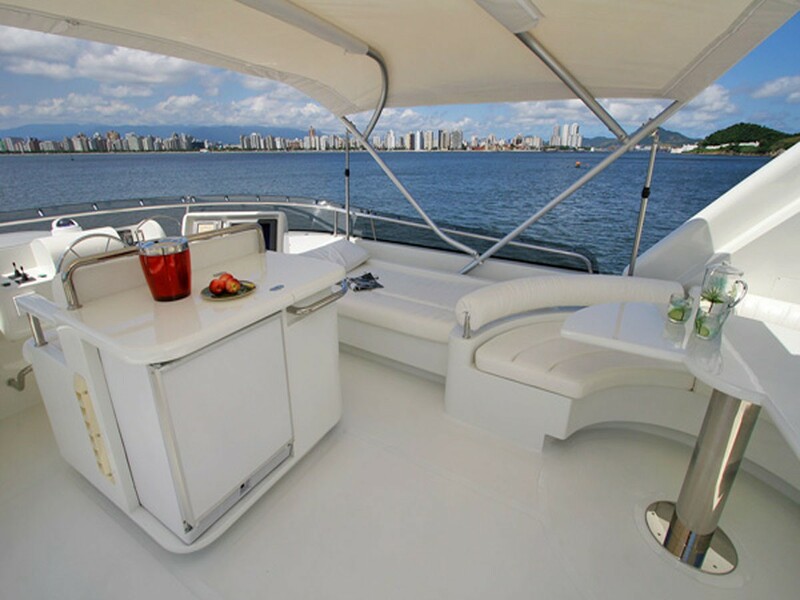 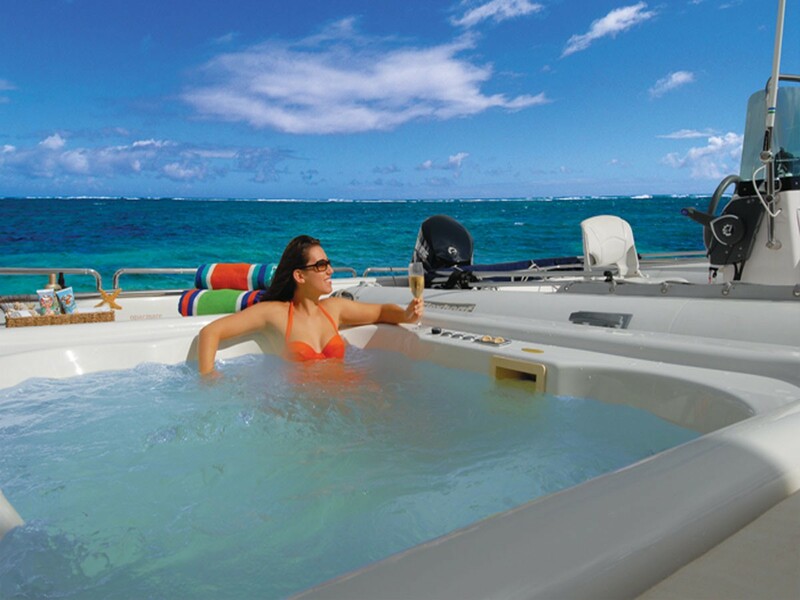 The sundeck above offers a Semi-shaded area with bimini. 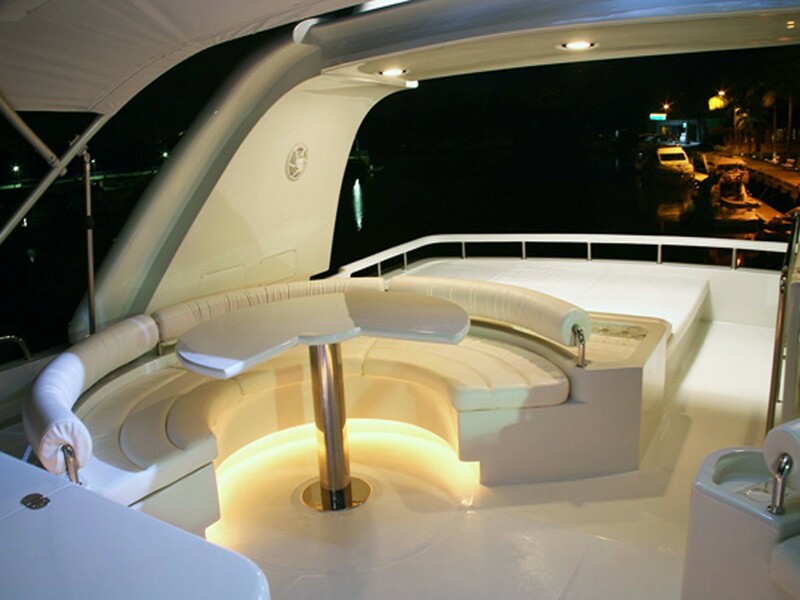 There is a wing station with 3 helm chairs, a round al fresco dining table with circular seating. 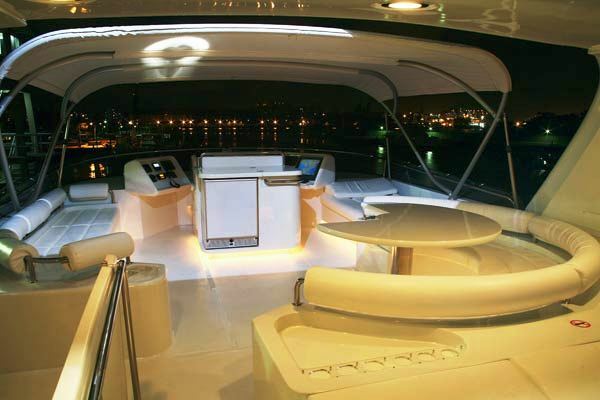 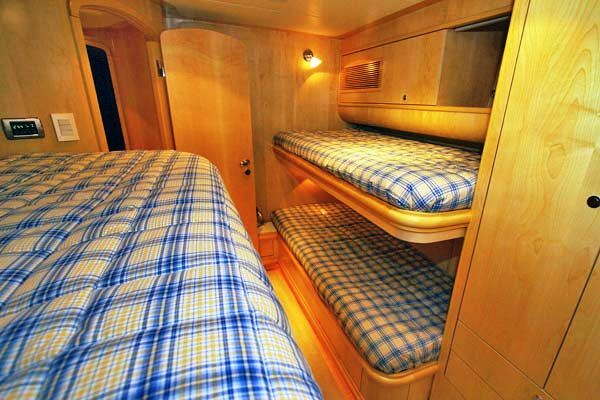 Sun cushions astern and sofa seats and cushions forward on either side. 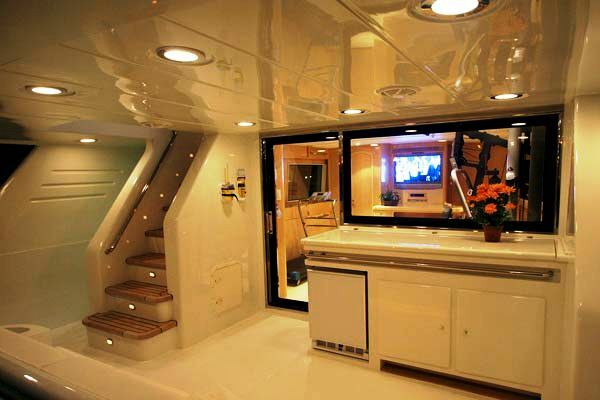 There is also a convenient Wet bar with fridge and icemaker. 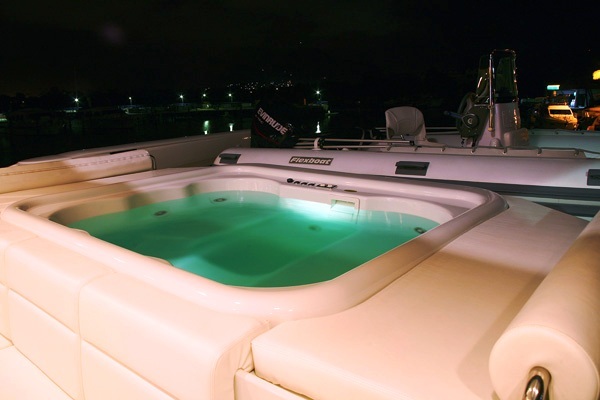 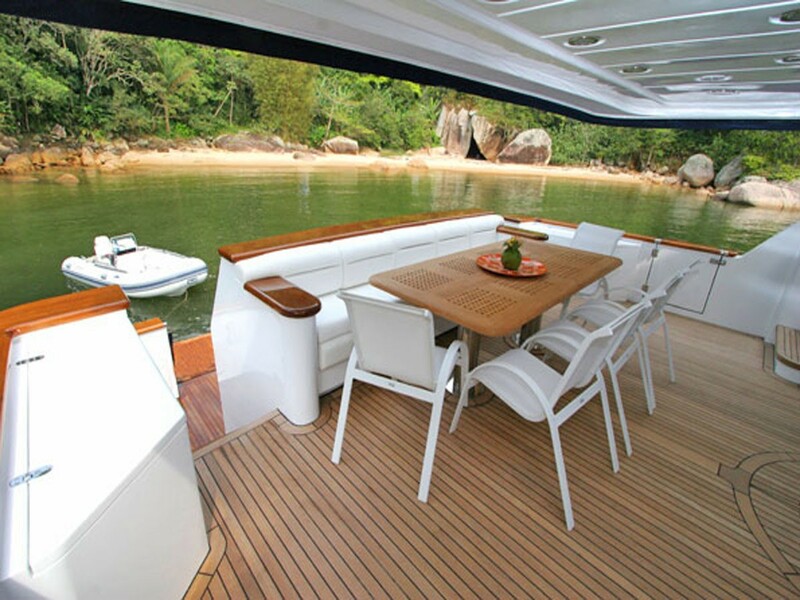 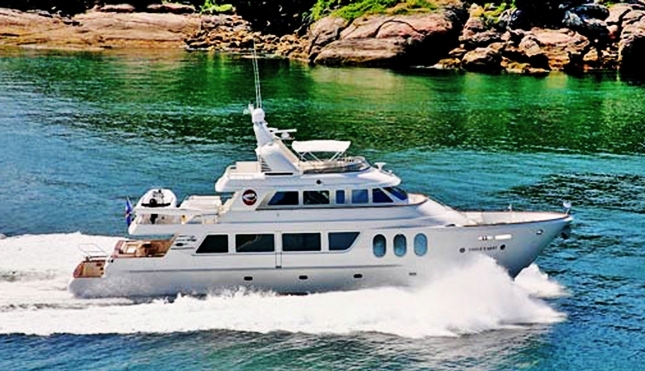 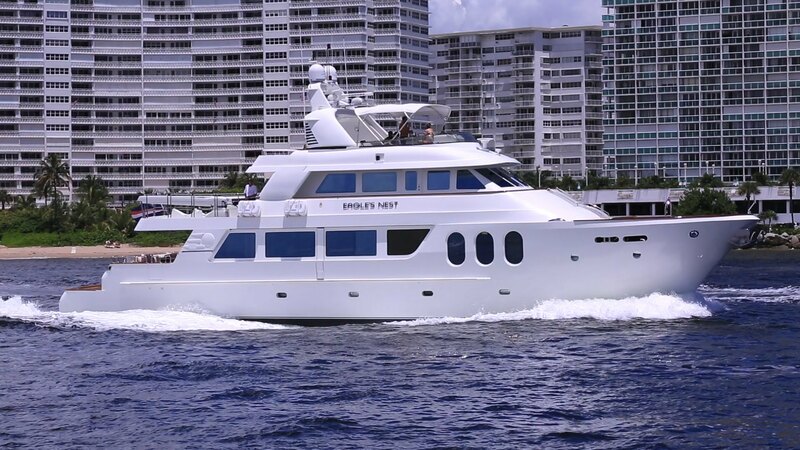 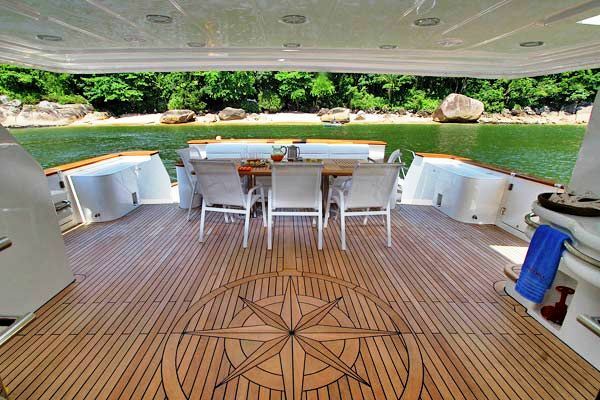 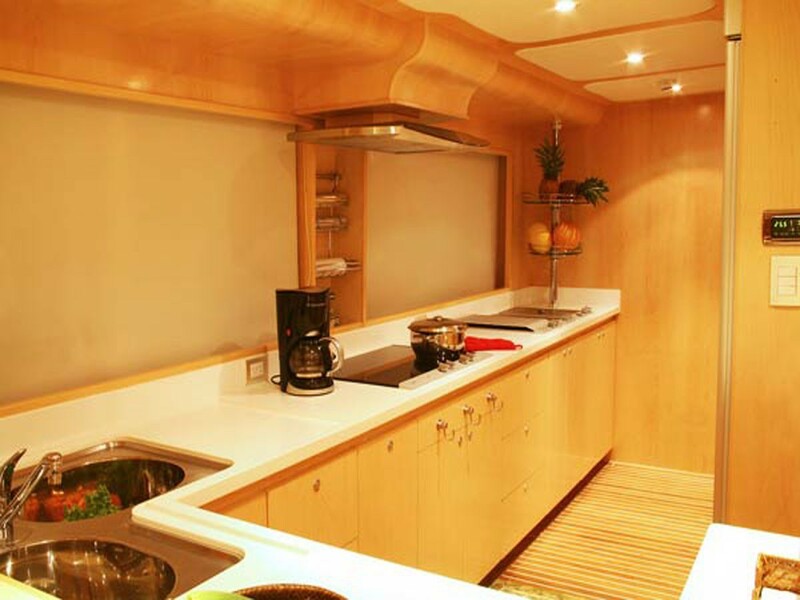 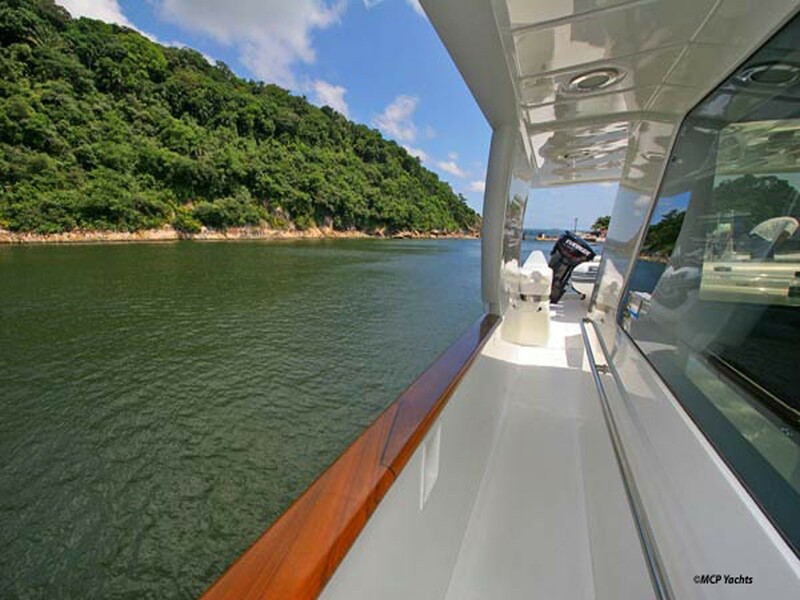 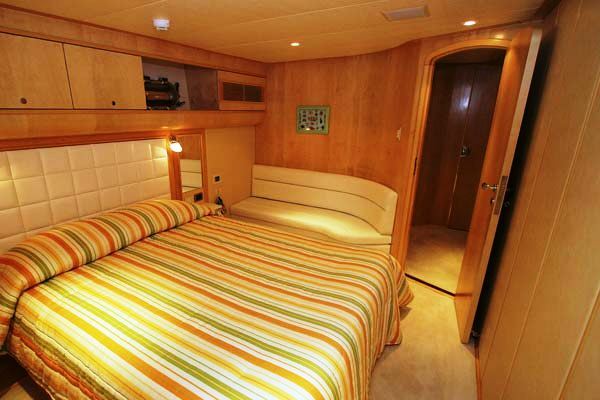 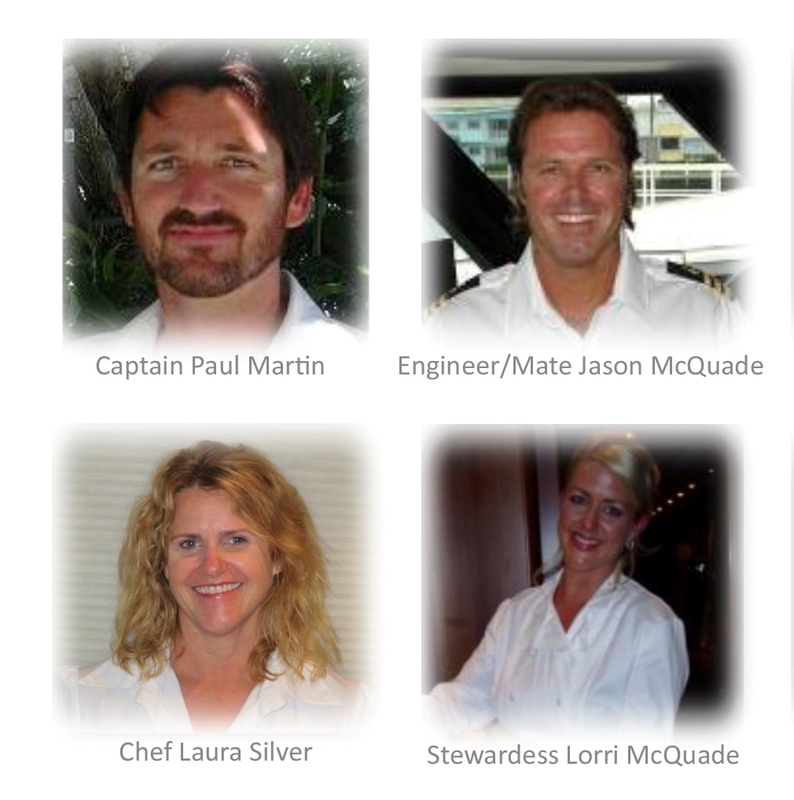 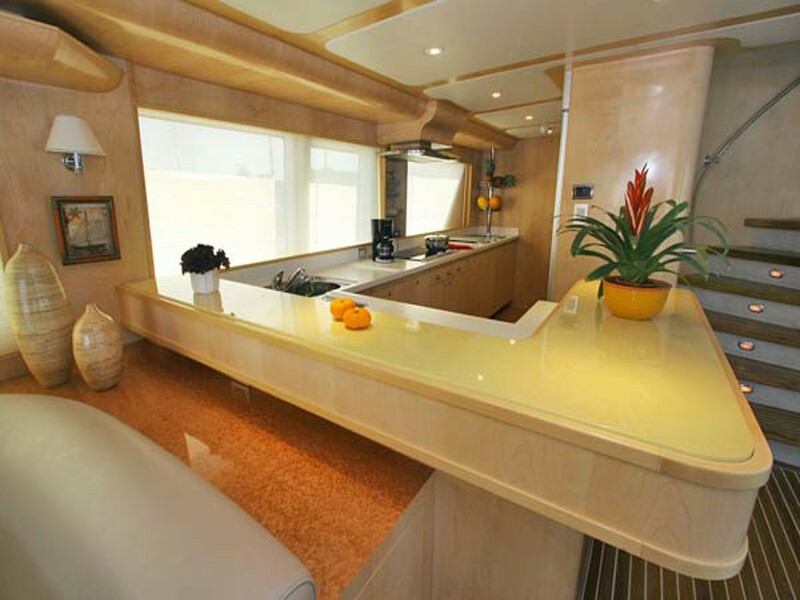 Motor yacht BERADA has accommodation for up to 10 guests in 4 cabins. 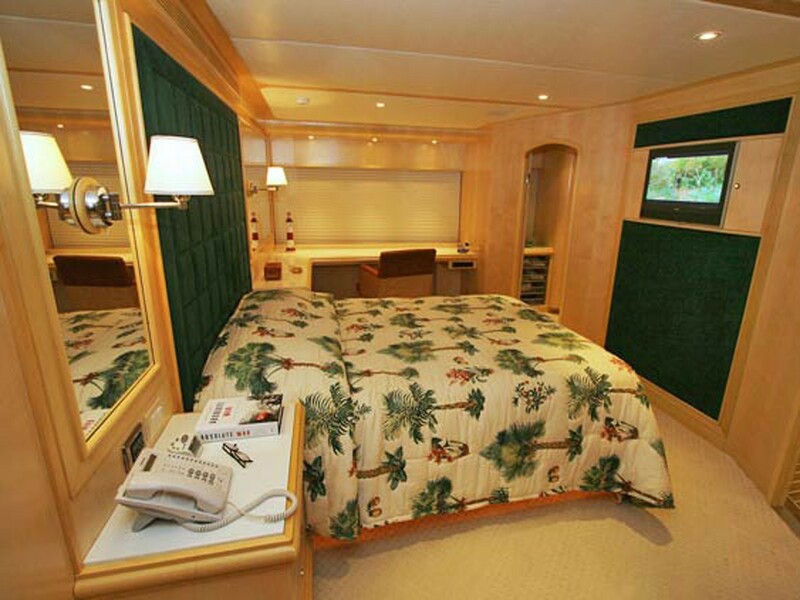 Her on deck master stateroom has a walk-around queen bed, a 26” TV with Direct TV individual satellite receiver, a desk with drawers to port with large OBLO viewing windows, two of which can open. 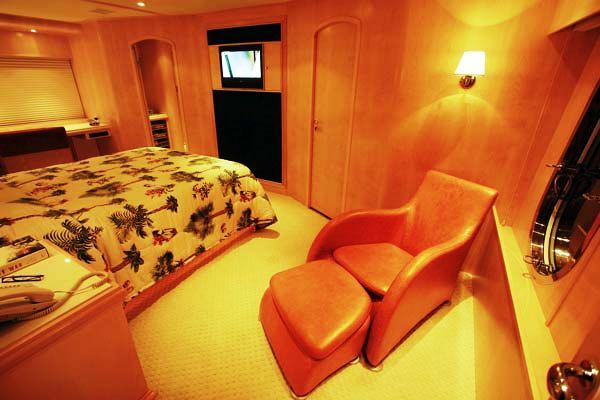 There is a reading chair to starboard, as well as a walk-in closet forward to port. 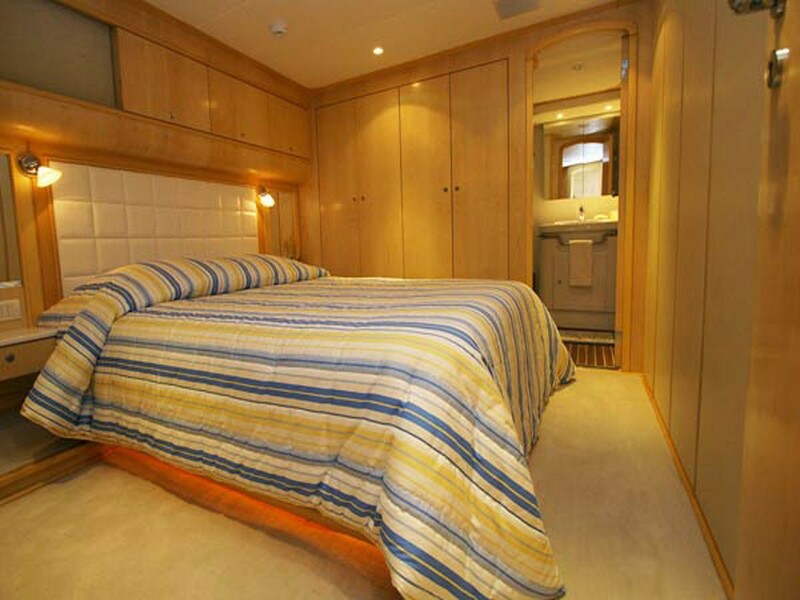 The en-suite for this cabin is situated forward to starboard with head and bidet, plus an oversized stall shower and sink. 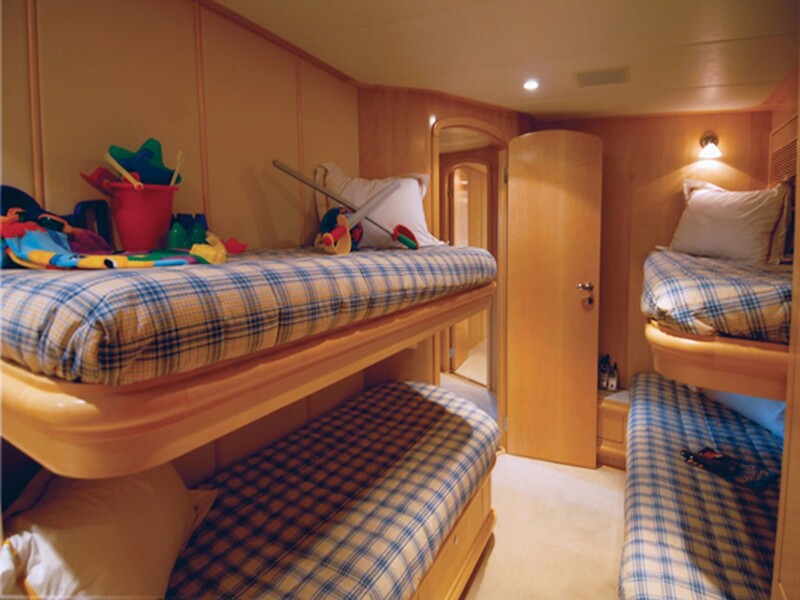 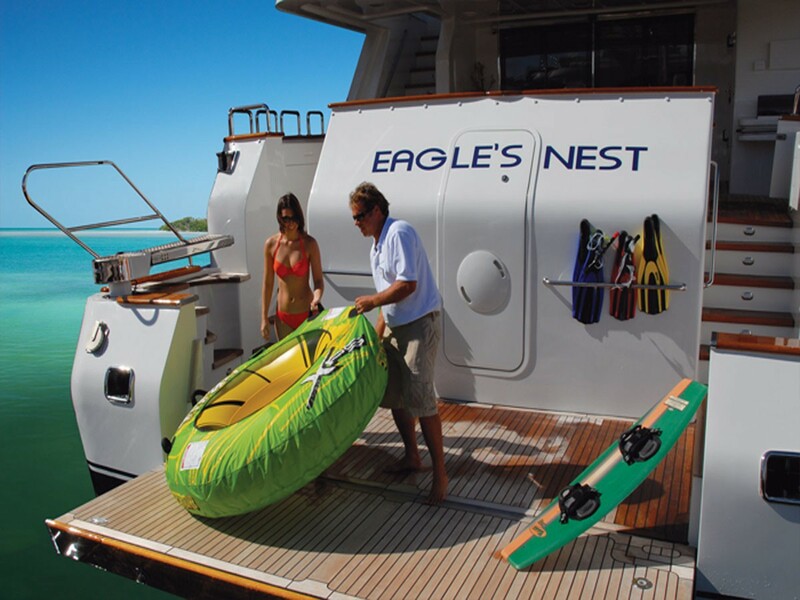 The remaining cabins are located below deck and include 2 mid-ship queen cabins to Port and starboard with lockers, drawers, sofa and en-suite head with oversized shower, head and sink, and a twin cabin to port with 2 upper and lower built-in bunks accommodating up to 4 children. The En-suite bathroom has an oversized shower, with bench seat, head and sink. 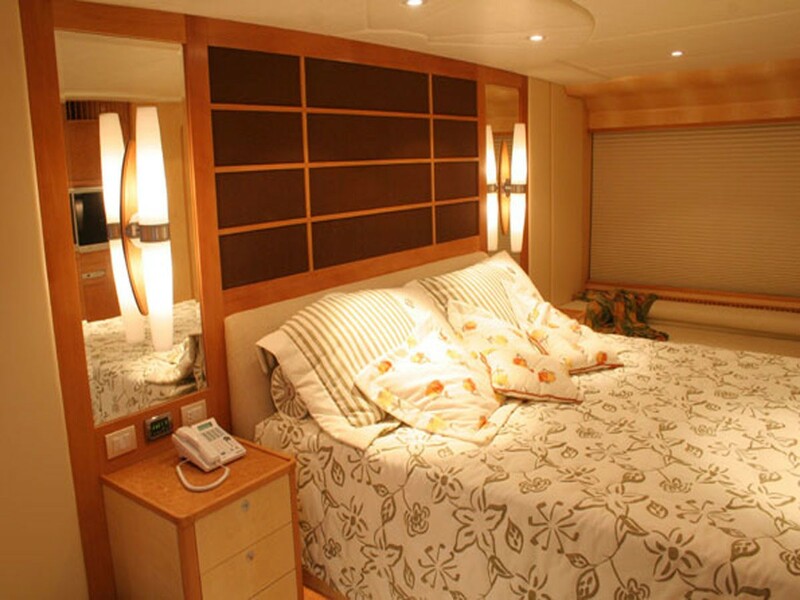 All staterooms have a Crestron audio system with surround sound, reading lights next to the beds, complete blackout blinds, hairdryers, and port holes allowing natural light to filter the lower deck. 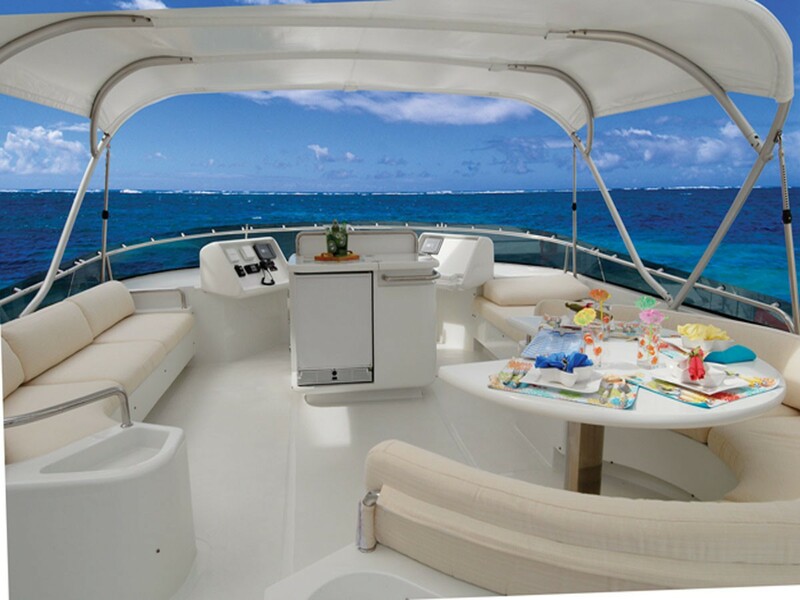 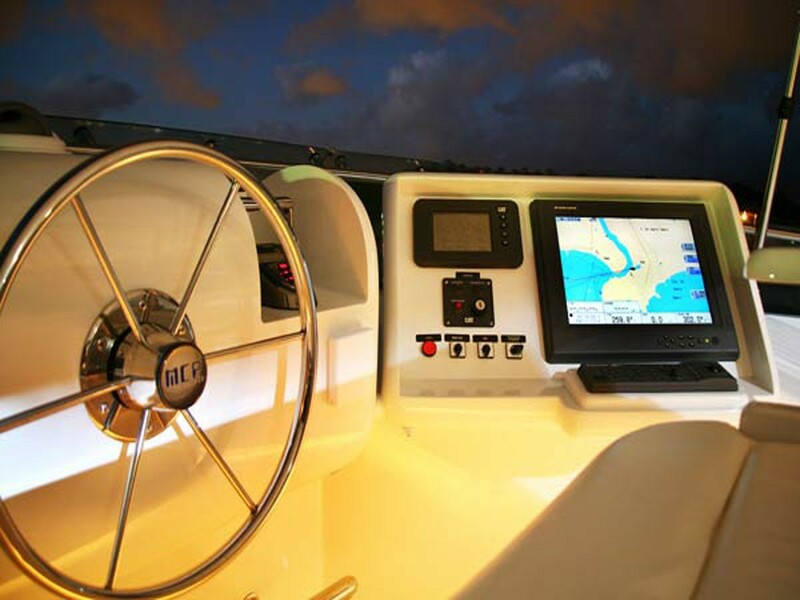 Tenders and Toys onboard motor yacht BERADA include a 15’ RIB w/115 HP outboard engine, Snorkeling gear, Scuba gear (with compressor), Fishing Gear, RENDEZVOUS DIVING ONLY and BBQ’s in galley, on bridge deck and separate BBQ’s for beach. 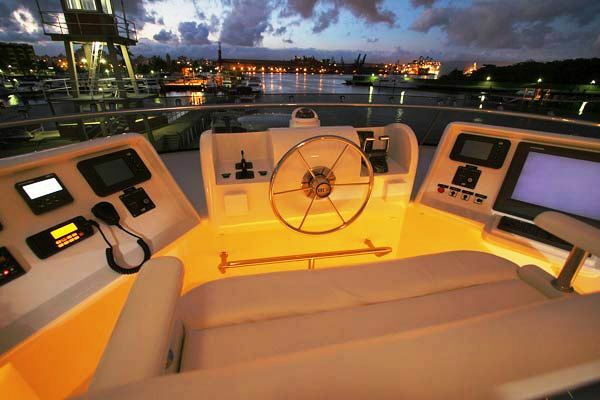 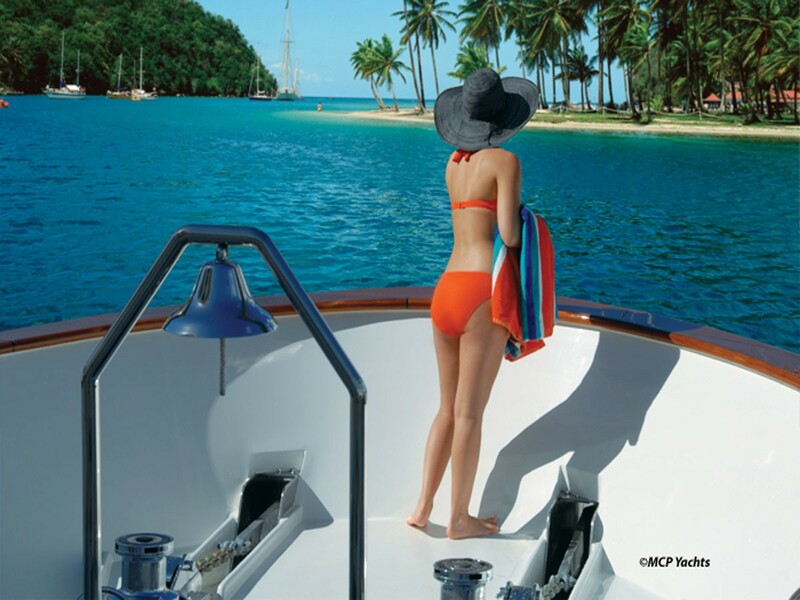 Communications Include a Wi-Fi Router with Amplifier (where available/ in marinas), Cell phone, Satellite Phone (fleet 55).